Apologies to Mark Galley but I've doctored the logo he designed for us. As good as it was, and I'm not taking anything away from Mark, it just didn't feel right for us; an alien if you like representing nothing about us. It needed a personal touch. Good old Photoshop to the rescue. I've included a couple of our own bikes (mine and Dean's). I apologise for not included the other Jangler's bikes. Gaz's bike I have no suitable picture of, Matt's bike is black and wouldn't work against the background and Loz and Neil's didn't look symmetrically right without a fairing. For those of you who can't speak Latin (Where would we be without online translation?) the writing translates to 'Ramble on and sing your song', a phrase close to Matt's and my own heart. Well if I'm honest 'Procedo protinus' actually means 'Continue forward', the best I could do with the absence of an exact translation for 'Ramble on'. 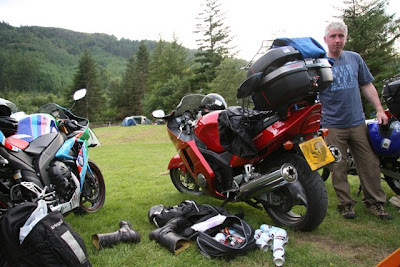 'Spouting sh*t since 2006' is about right really, so here's to hopefully many a more year of wonderful motorcycling and the ensuing ramblings. The old logo. At least part of you lives on. 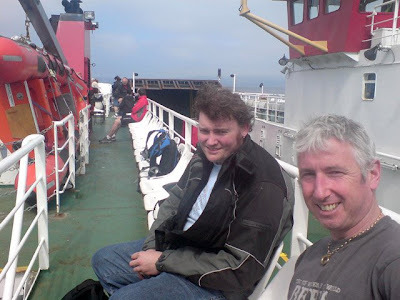 With Loz taking three weeks off work to ride around Iceland, Dean and I decided to take a week off work and head up to the top of Scotland with him where he departed on a ferry from Scrabster. Iceland doesn't score well on tarmac roads so Loz took his Yamaha XT which is more suited for off-road. 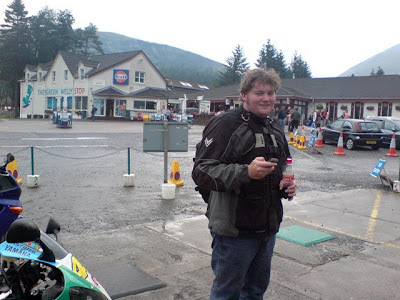 Once at the ferry port I texted Loz to tell him what was going on, only to get a reply five minutes later telling me he was already on Arran, tent pitched and supping beer. Apparently he couldn't find a campsite either. The little t%&t couldn't sleep the night before and so travelled through the night. Dropping us a text to let us know so that we didn't waste two hours in stinking hot weather and sweaty leathers trying to find a site clearly wasn't of any importance. This obviously led to a swift phone call from myself informing him of what we thought he was....... words of which would be inappropriate to write down on this friendly bike blog! Once on the ferry with a drink and some food, tempers quickly subsided and we felt the holiday had begun. Although, we were still threatening to give the stunted little hobbit a good kicking when we caught up with him. 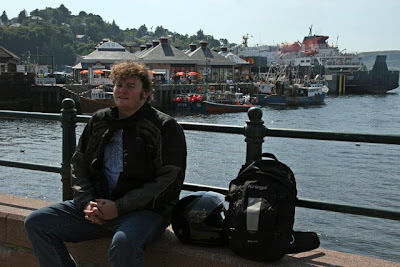 Dean on the ferry from Ardrossan to Brodick. 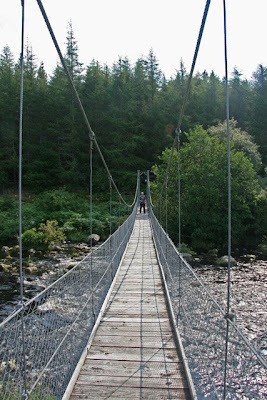 The crossing takes about 50 minutes and costs around £25.00. It was a lot plusher than expected and had a good cafe and restaurant on board. 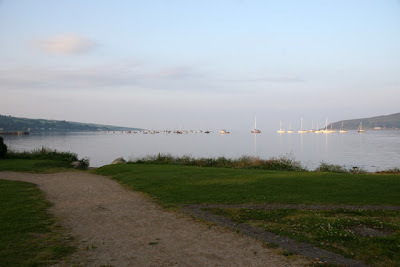 The splendid campsite on Arran situated in the town of Lamlash. I can't remember the name of the site and I can't find it anywhere on t'interweb either. Heading south through the town, immediately turn left just over the sharp right handed bridge (The turning is almost on the bridge). If you see the fire station you've gone a wee tad too far. Follow the road down and it's on your right. The lady on reception informed me that she did breakfast baps in the mornings although we never tried them, opting for our very own full English instead. 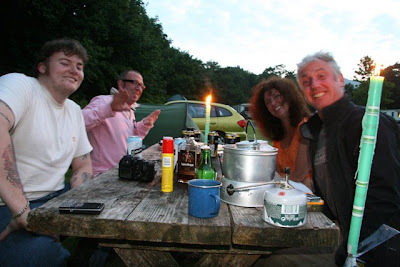 More of the campsite, a chilli con carne and miraculously a 'still alive' hobbit. 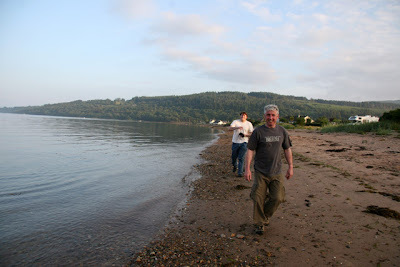 There's a five minute walk from the site down to a beach which takes you into town. 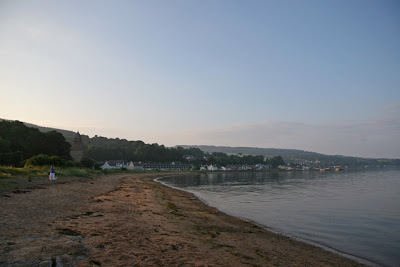 Lamlash village at the end of the beach where you'll find a couple of pub/hotels, a convenience store and a curry house! What more could you ask for? A view from the beach. The end of the path from the campsite. 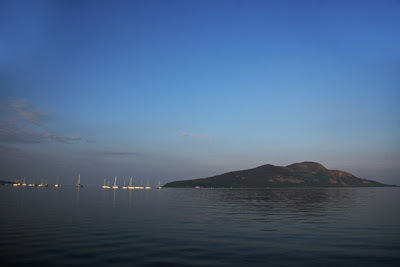 On the lash in Lamlash. 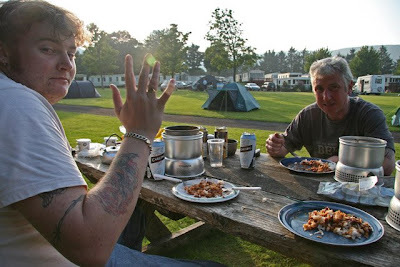 Our Glaswegian campsite neighbours. Thoroughly nice people and great entertainment. The resident midges of Arran seemed to be enjoying our company as well, much preferring our flesh to the delights of beer. 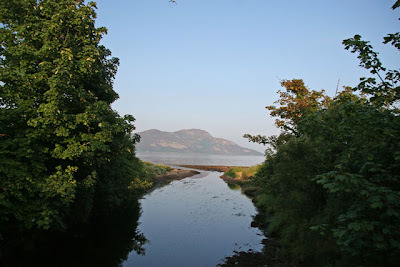 Sunday 27th we got away to an early start and took the coast road around Arran in a clockwise direction. 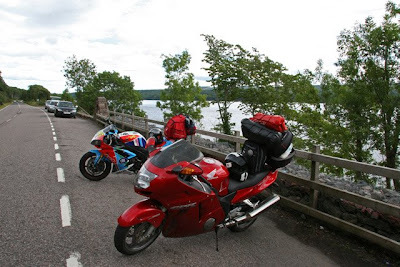 The 40 mile or so stretch of road was not best suited to sports bikes being very tight, twisty, bumpy and potholed but the scenery was fantastic which more than made up for it. 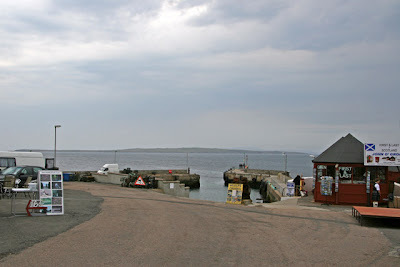 We departed the island from Lochranza over the Kilto Claonaig to the Kintyre peninsular south of Tarbert, which cost about £10.00 and took around 30 minutes. 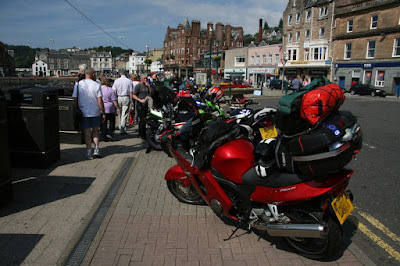 Once off the ferry and riding northbound we soon arrived at Tarbert. 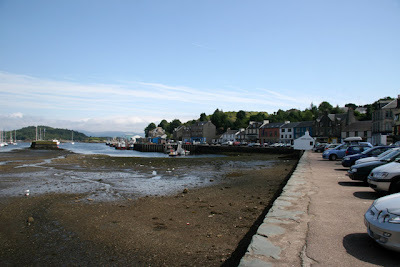 Tarbert is a pleasant enough town spoilt only by the the local petrol station owner. Not only did he rip us off for fuel by charging 124.9p per litre but had the cheek to write all our registration numbers down in case we decided to do a runner without paying. Taking our helmet and gloves off before refuelling we must really have looked like we were about to do a splash and dash on him. OK, admittedly I once did a runner from a curry house but it was 23 years ago and lets face it, who hasn't at some point in their life? Anyway, he must get a lot of trouble with drive offs which is no surprise really considering his prices..... Brought it all on himself. 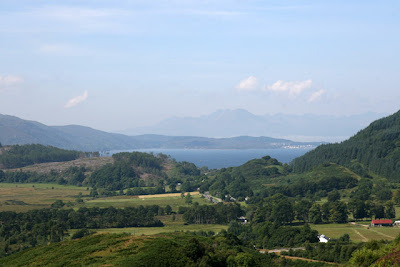 Travelling northward (on expensive fuel) we did a slight deviation to the picturesque village of Crinan overlooking Jura. 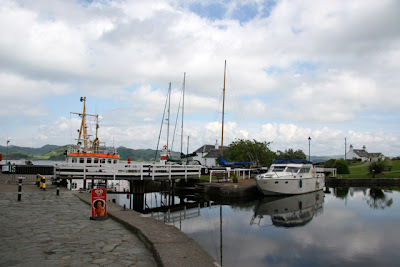 The village is well known for the Crinan Canal and is well worth a visit if you're in the area. 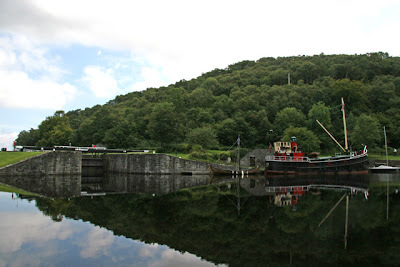 The road into Crinan from Lochgilphead follows the line of the canal and is a little gem. It's worth noting that the village is divided by a headland. Both sides are very picturesque and worth a nosey. Branching off to the right takes you down to the locks and a cafe where you can get tea, coffee and an assortment of light bites. 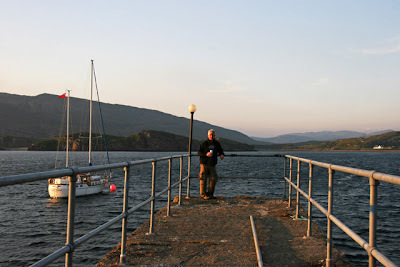 Or the other option, if you're feeling well off or have just re-mortgaged is to feed your face in the Crinan Hotel. 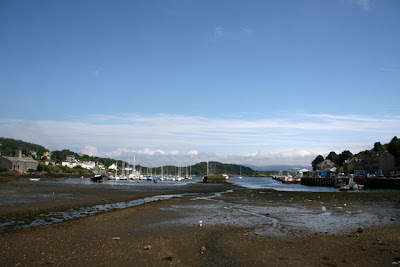 The end of Crinan Canal where it enters Loch Crinan. Leaving Crinan we headed up the A816 to Oban. This road was designed and built by the biking gods! It has to be one of, if not the greatest biking road in the UK. It can be very fast in some sections but also has a lot of snaking sections that almost double back on themselves in places. 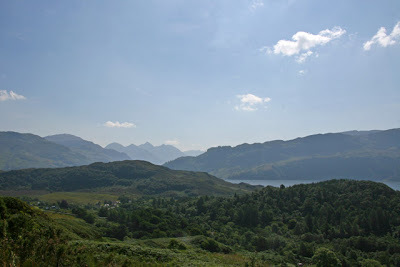 The views along the way are spectacular too if you get chance to have a glance around. 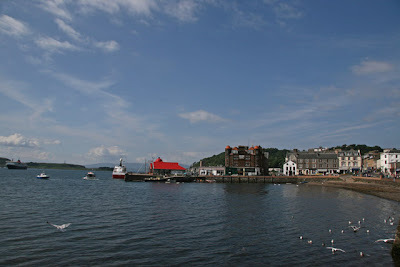 Oban's a pleasantly busy coastal town and a nice place for a pit stop. There's always a few bikers on the front to have a natter to as well. Oh, and there's a fish and chip shop..... smelt good too. A guy stopped to talk to us as he was walking past with his wife and two young kids. He was telling us about fantastic biking roads in the area that the average tourist would probably miss. He got so excited at one point I thought he was going to start foaming at the mouth. So excited in fact that I think he forgot he was in charge of his kids when he piped up with; "You really must ride this road, it's fu&*$ng awesome man!" Mind you, I'm sure drinking and swearing is taught from a much younger age in Scotland. It's probably on the School curriculum. 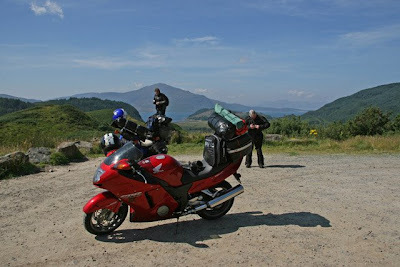 Suitably refreshed from our stop in Oban it was onward to Fort William at the base of Ben Nevis. The campsite (Glen Nevis) two minutes down the road from the town was nothing short of superb. Not only did it have a decent shop selling a good range of food and camping gear but it also had a burger van! The views of Ben Nevis from the site were amazing, and clearly the highland midges appreciated the area too judging by the state of my legs the following morning. 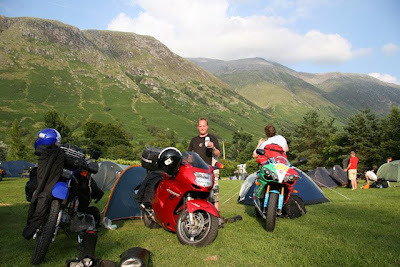 Glen Nevis Campsite at the foot of Ben Nevis. The tent you can see in the background just to the right of Loz's bike was a 3 man tent with two young Dutch couples in it. I'm really not sure what was going on, but all night there was lots of giggling and stuff. Maybe they were watching a funny dvd or something..... Inevitably they ended up Christened the Wife Swappers. In case you're wondering, it was I Chinese chicken satay stir fry we were concocting. And damn nice it was too. The midges seemed to like that as well. Obviously all the empty beer cans weren't ours. We merely took it upon ourselves to tidy the campsite up a bit. Everywhere we went somebody would be there taking a look at Dean's R1. He even had some Dutch people taking photos of it. Me thinks it's nothing more than a substitute for something very small in the trouser department if you catch my drift? The next morning following another full English breakfast we continued heading northwest in glorious sunshine. Just south of Fort Augustus we turned off onto the A87. This road took us past undoubtedly the most stunningly picturesque section of Scotland we travelled. I really wanted to pull over on several occasions to take some photos but we had a long journey ahead of us and time wasn't really on our side. 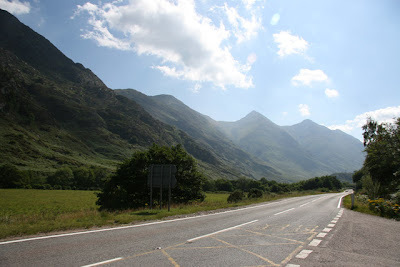 We eventually turned off the A87 onto the almost equally nice A890 east and then west onto the A835 to Ullapool where we camped for the night. The days riding although hard work was probably the best of the holiday. I really can't put into words just how stunning the landscape was. 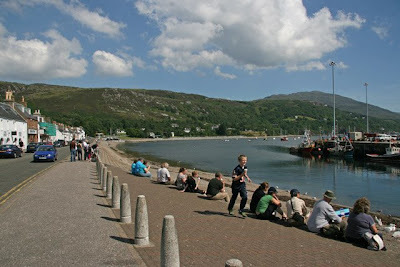 Ullapool was a nice place and home to an award winning chippy and fish restaurant. Obviously we had to try out the fish and chips, and damn fine they were too. 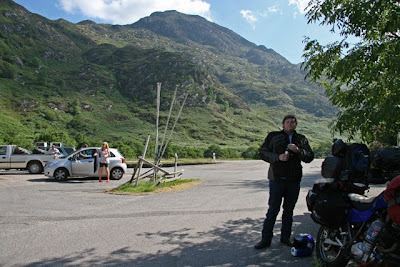 The campsite 3 miles north of Ullapool on the A835 was cracking. 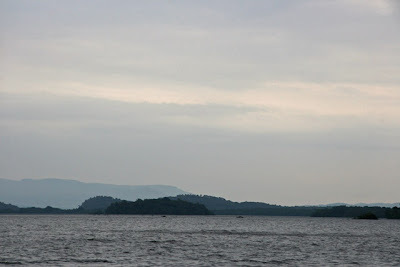 It was surrounded on three sides by a loch and had its own beaches. Once we'd pitched our tents the realisation set in that we had no food for the evening or breakfast and none of us particularly wanted to ride back into town to the local Tesco. After the usual bickering Loz agreed to go so long as he could take my Blackbird. Result! Or it would have been if he'd actually remembered to bring back some stuff for breakfast. At least he didn't forget the beer so he was quickly forgiven. 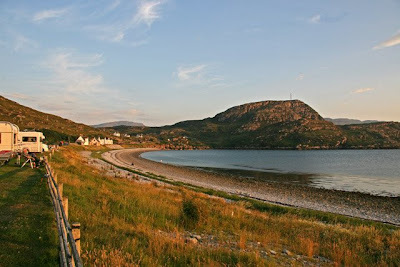 Ardmair Point Caravanning and Camping Park just north of Ullapool on the A835. 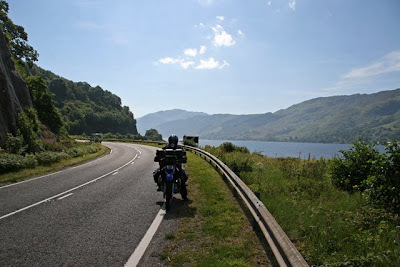 The following morning, this time with no full breakfast inside us, we headed east on the A837/A838 onto the A9 and north to John O'Groats. 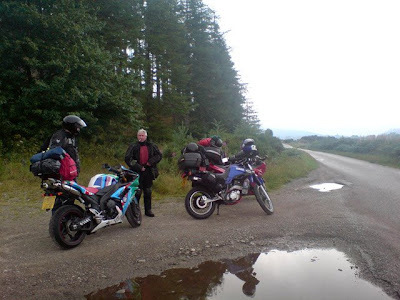 The original intention was to keep west and cut across the very top of Scotland, but our arses were profusely protesting at the long hours in the saddle so we opted for the shorter distance saving some 70 miles or so. 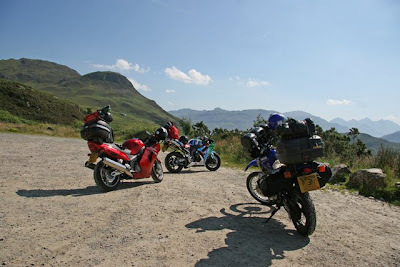 The route we took was very pleasant but whether single track roads with pull-ins class as A roads remains debatable. A debatable Scottish A road. A rickety bridge. It gave us a good 10 minutes of childish fun. Somewhere north of Latheron on the A9 Loz's tedious pace finally caught up with me and I decided to get a spurt on and disappear into the distance with Dean closely following. 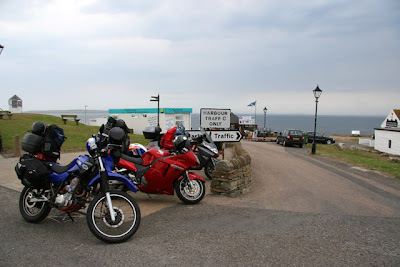 We continued on our own until finally arriving at John O'Groats. Why the hell we bothered going there is beyond me. The place consisted of a house, a shop, a boarded up hotel and probably Scotland's smallest harbour but don't quote me on it. Loz eventually caught up about half an hour later and after the obligatory photos we got back on our bikes and headed off to Thurso where we were to camp the night. Being cheapskates we weren't prepared to pay for our home town to be added to the signpost. 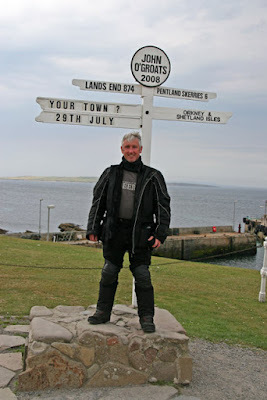 John O'Groats. Interesting it is not. 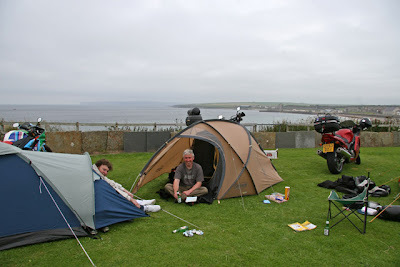 The reason for camping at Thurso was because two minutes down the road is Scrabster where Loz was to set sail from at 6 O'clock the following morning. 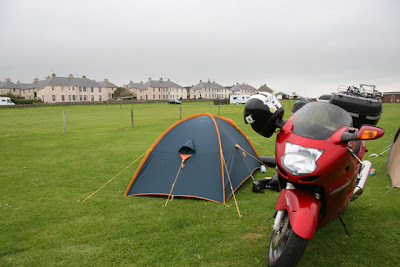 This is the only reason why anybody would choose to camp at Thurso. God only knows what the excuse for living there is. ..... Not quite so when you turn your head the other way. So that's why Loz stuck a rack on the front of his bike. 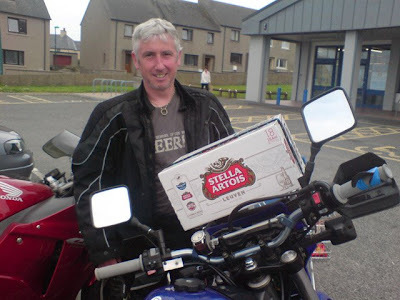 One good thing to be said about Thurso is the local Lidl sells cheap Stella so it wasn't all bad. 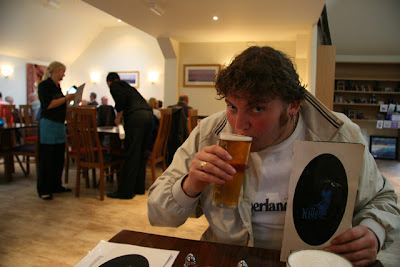 The night in Thurso was an early affair. I'm sure it was about 8 ish when we hit the sack. 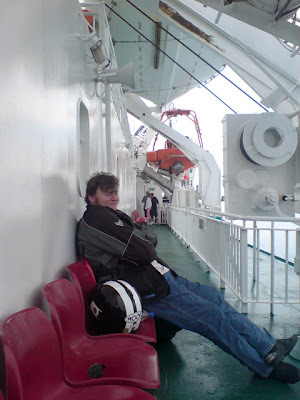 Loz needed an early night before waking up to pack his stuff away at 3 O'clock in the morning to head down to the docks. And that's the last we saw of him as we wished him well on his onward journey to a chillier climate. 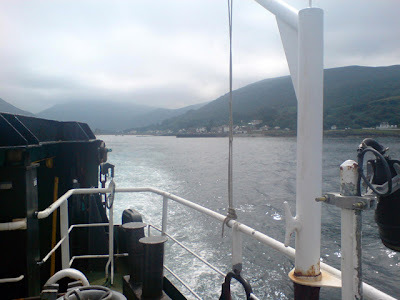 The following morning with Loz and his lumbering mule safely on a ferry, Dean and I made much swifter progress heading back south to Fort William for the night. 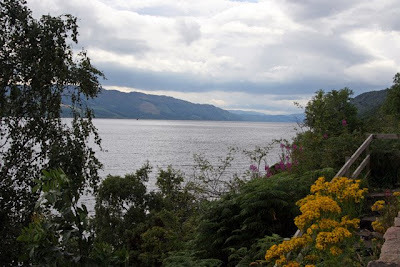 Continuing on, I was looking forward to the road along side Loch Ness. I'd been there before and it's a great biking road, but this time it was as good as gridlocked with holiday traffic. Frustrating is putting it mildly. 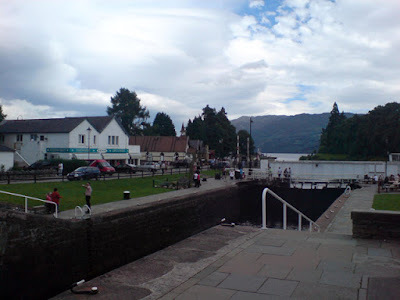 At the bottom of Loch Ness lies Fort Augustus. 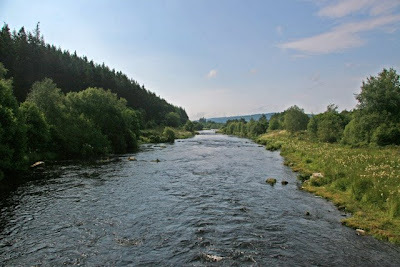 This is where the Caledonian canal (which stretches right across Scotland) connects to the southern end of Loch Ness. 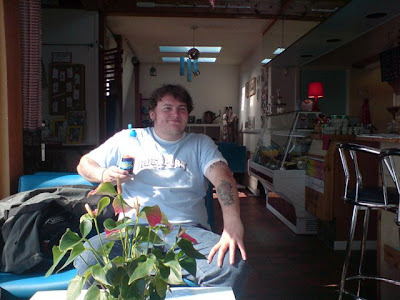 It's another nice spot for a rest with a good pub called the Lock Inn which sells nice food. 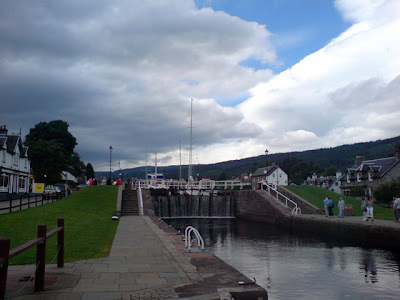 The end of the canal where it joins Loch Ness. 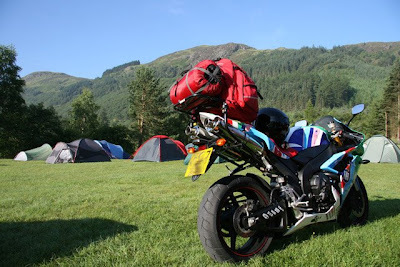 After Fort Augustus we headed back to the campsite at Fort William for the night. The evening was spent drinking beer, eating from the burger van (which was very good (for a burger van)) and dodging rain showers. 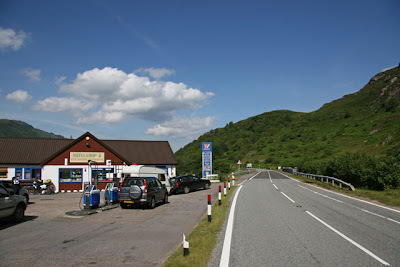 The Green Welly on the A82. Very popular rest stop for bikers. 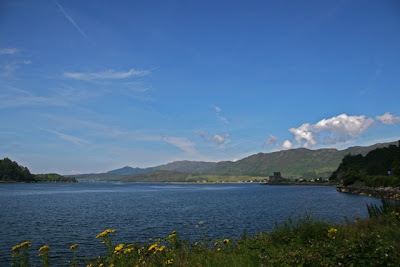 From there we set off south down to Luss which is on the banks of Loch Lomand and now classed as a Conservation Village. 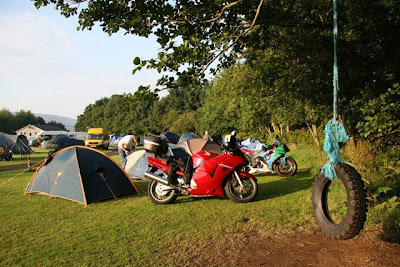 We'd used this campsite before when we went to Scotland in 2005. The staff are very friendly and even supply you planks of wood for your side stand. 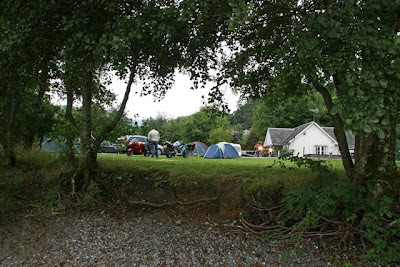 The Camping and Caravanning Club site at Luss. A view of our tents from the private beach. 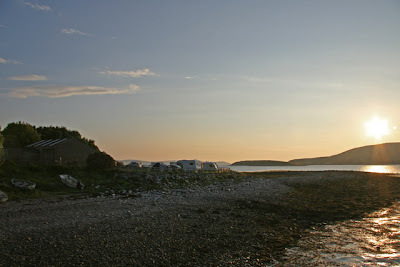 Loch Lomand from the Campsite. From our tents it was only a five minute walk down into town where you can have a nice pint and something to eat at the Colquhoun Arms hotel. 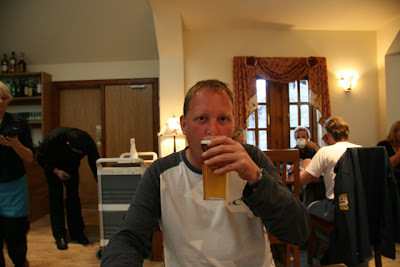 This was a welcome break for us as it was the first pub we'd been in all holiday. Needless to say we ended up drinking too much. We chose not to eat there, instead opting for The Village Rest on somebodies recommendation. The food was good at a more than reasonable price. 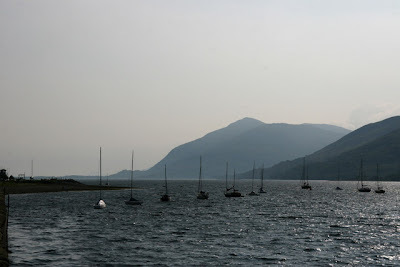 After leaving Luss it was our intention to spend two days at Keswick in the Lake District. However, the rain was that bad we made a split second decision at a petrol station to ride all the way back home instead. 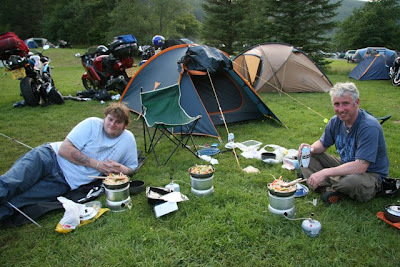 And so I never did get my curry in Keswick that I'd waited all holiday for. I had one that night back at home though. And a soak in the bath. And a nice comfy bed. Loz is due back from Iceland on the 26th August, hopefully with lots of photos and a great story to tell.